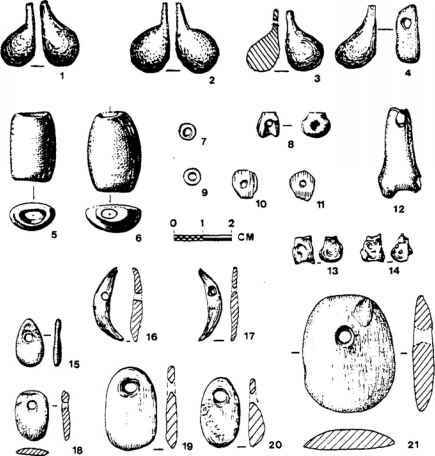 Whatever the specifics of individual phases and chronology, the PPN is a relatively well known archaeological entity, with well over 200 sites documented throughout the Near East (Bar-Yosef 1981a; Moore 1973, 1978). In the Levant during the PPNB, Jericho was clearly an important center, covering an estimated 10 acres (c. 4 ha) (Kenyon 1957). Although Jericho remains to many the "typical" PPNB site, newer studies have documented a large range of site types. These include small settlements such as Beidha (Kirkbride 1966,1968), Ghwair I (Najjar 1994; Simmons and Najjar 1996, 1998), Nahal Oren (Noy et al. 1973), and Tel Ramad (de Contenson 1971; de Contenson and Van Liere 1966), to larger villages such as Tel Abu Hureyra (Moore, 1979; Moore et al., 1975) and Beisamoun (le Brun 1969). Recent excavations east of the Jordan River, in fact, have documented huge settlements greatly exceeding Jericho's horizontal extent. These include 'Ain Ghazal and Wadi Shu'eib (Figure 12.1). In fact, Bar-Yosef and Meadows (1995:76, Figure 3.7) and Kuijt (1995:Table 6.2) indicate that sizewise, Jericho tends toward the smaller end of the scale for Neolithic settlements. In addition to villages, numerous specialized small sites are known throughout the Levant, with many of these located in marginal environmental areas (e.g., Bar-Yosef 1981a; Bar-Yosef and Phillips 1977; Betts 1990; Burian and Friedman 1973; Garrard et al. 1994; Noy 1970, 1971; Rollefson and Frohlich 1982; Simmons,1980, 1981). Most of these are open-air sites, although a cave (Nahal Hemar) containing well-preserved ceremonial PPNB materials has recently been investigated in Israel (Bar-Yosef and Alon 1988). Another cave, El-Khiam (Echegaray 1964,1966), presumably contains PPNB materials as well. Not all of these sites may have been inhabited by agriculturists, and this variety of site types suggests that a wide array of economic pursuits was followed during the PPNB. The larger PPNB villages contain all the "classic" elements that have interested researchers working with the Neolithic. These include architecture, abundant lithic materials, burials, ceremonial objects, such as the spectacular 'AinGhazal human statues, and economic data in the form of plant and animal remains. There seems little doubt that while PPNB society may have been essentially egalitarian, regional hierarchies between communities existed, as reflected in public structures, artifacts, burials, and site size (see Chapters 5-7 in this volume). Most researchers believe that these material remains reflect changes in social organization toward more complex communities where many decisions were made by extrafamily entities (Bar-Yosef and Meadows 1995:74-82). The operation of a PPNB "interaction sphere" (cf. Bar-Yosef and Belfer-Cohen 1989) indicates a social structure far more complex than what had previously existed.